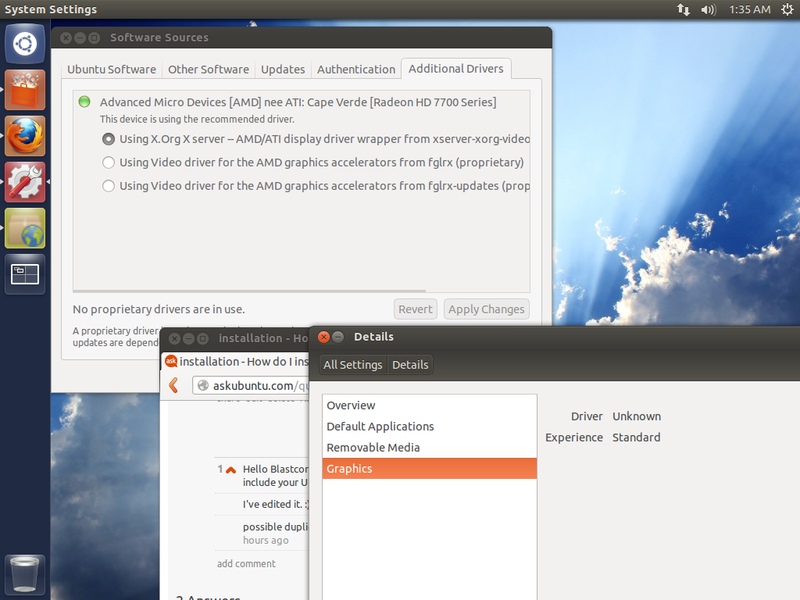 I am using Ubuntu 12.10 64-bit and my graphics card is ATI Radeon HD 7770. So for example I want to install ATI Drivers, which I can simply find them on AMD Support page, which will give me the "AMD Catalyst™ 13.1 Proprietary Linux x86 Display Driver", fine I can download it though AMD page. But there's some software that I can install from the Software Center (I actually, didn't check if AMD Catalyst was there, but I don't think…) Is the same to download and install the software from their original site other than downloading it though the Software Center? If I install it though their site, will the program still auto-update when there's a new update for it? You should try the most canonical method : open the Dash Menu, type "Software Sources", launch the "Software Sources" app, go to the Additional Drivers tab, follow the suggested instructions. This will install the driver that is tested and advised by the Ubuntu community (not necessarily the latest one). As a very general rule, in Ubuntu you should prefer to install apps from a store rather than a developer-website or a download-website. Start with the Ubuntu Software Center. When you are familiar with it, come back to this page and you'll be able to try the following "stores", without any particular order : Launchpad PPAs, Steam, Desura, Humble Store, apt-get. Not the answer you're looking for? Browse other questions tagged installation ati updates software-center or ask your own question. How can I install AMD ATI Catalyst Display Driver In Ubuntu 13.10 64bit?